Welcome back to the second part of Pronunciation – Knowing your Articulators. I am assuming that you have already read and understood Part 1. If you have not, then please read Part 1 before going through this article. For the ones who have read the last part, let’s explore further. It’s time to know the last 5. Some of the organs here work automatically and we exercise less control over them. But you should know how these help us speak and be more aware of them. You should know your instruments well, to make good use of them. This is at the back of our mouth and moves up and down to let the air out through the mouth or the nose. Understanding the movement of the soft palate can be a little complex because the movement is not visible and is not felt strongly. Watch the video below and see how the soft palate moves up as you speak. Note- Keep the volume low. Were you able to notice how the movement happens? The soft palate moves downwards when we breathe through the nose or speak some nasal sound like m/n. When we breathe through the mouth or speak any non-nasal sound, then the soft palate goes up and shuts the nasal passage. Try to feel its movement by making different sounds. Avoid using your tongue to touch it, because that won’t be helpful or healthy. Try to make the sounds ‘thiiinnnggggggg’ and then ‘aaaaaa’ 5 times slowly. Keep your eyes closed and try to feel the movement of the soft palate. If you concentrate well, you’ll be able to feel the soft palate moving down and then up. As you must already know, without a tongue we won’t be able to taste food!!! It also helps us swallow and produce speech. Try to speak ‘d’ without moving your tongue. Keep your tongue flat at the base of the mouth, with no movement. Are you able to say ‘d’? When I try this, I end up saying ‘e’. Our tongue obstructs the air flow which helps us in producing many consonants. This is the muscular area behind our nasal and mouth cavity. It is a very important part of both the respiratory and digestive system because food and air both pass through this pipe. It also plays a prominent role in the production of sound by resonating the sound, which means that the pharynx fills with the vibration and echo of the sounds we produce. This resonance gives our voice a deeper and clearer quality. It also provides good strength to our voice. Did you know that the opera singers make use of the pharynx to produce their incredibly loud and clear sounds? They increase the size of their pharynx by keeping their larynx low. The more the area of the pharynx, the more echo and vibration, and better the sound. The larynx is also known as the voice box because it is like a chamber for the vocal cords to resonate the sound. 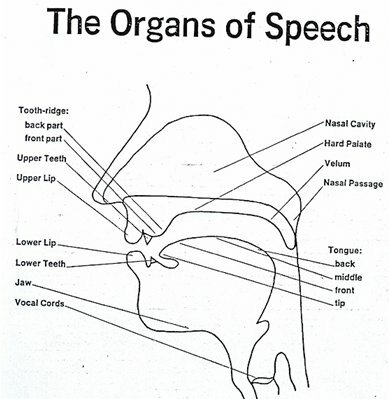 The vocal cords are inside the larynx and produce sound for us. The larynx controls the pitch and loudness of the sound. You must have heard about “Adam’s apple”, that is the larynx. Although girls don’t have Adam’s apple, they do have the larynx, it’s just that it is not clearly visible. But you can feel it when you touch the front of your neck, below the chin and swallow. That thing that moves up and down is your larynx. In the speech organs mentioned above, tongue it most easily controlled, whereas the other parts usually work automatically. But for better production of sound and speech, we should know the use of these and if you ever want to be in a profession that includes your voice a lot, like being a singer or a speaker, then exercising these organs are very important. Do you have any questions? Comment below! And subscribe to get a notification every time there is a new post. We will soon be learning about the English alphabet. So, stay tuned! Very helpful piece of work, keep sharing!